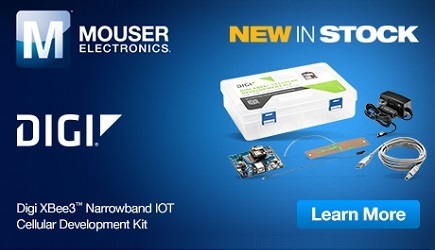 Nordic Semiconductor has announced that its nRF52810 Bluetooth Low Energy (Bluetooth LE) System-on-Chip (SoC) - a memory-optimized addition to Nordic’s nRF52 Series of class-leading, high-performance Bluetooth 5.0 certified SoCs - is now available in high volume for customers across the world. The nRF52810 rounds-out the Nordic Semiconductor nRF52 Series which includes the proven nRF52832 (with which the nRF52810 is pin-compatible) and high-end nRF52840 SoCs. The nRF52810 SoC has the lowest power consumption in the nRF52 Series and brings 2 Mbps of throughput, improved coexistence, and increased broadcast capacity with advertising extensions benefits of Bluetooth 5 to the most cost-sensitive, high-volume applications. This SoC retains the 64 MHz, 32-bit ARM Cortex M4 MCU of other nRF52 Series SoCs maintaining the performance demanded when employing functionality such as LE secure connections and 2 Mbps data processing. In addition, the nRF52810 SoC’s Flash-based software architecture brings over-the-air (OTA) application upgrades to products previously excluded by cost constraints. The S112 SoftDevice is an extensively-tested, optimized, lightweight stack designed to complement the nRF52810 SoC’s 196 kB Flash/24kB RAM allocation. The S112 SoftDevice occupies just 100 kB, ensuring ample spare memory for a wide range of mass-market Bluetooth LE applications and robust support for OTA application software upgrades. To optimize the performance of the nRF52810 SoC, the S112 SoftDevice is a dual peripheral/broadcaster only stack but retains the Bluetooth 5/Bluetooth LE features of: 2 Mbps throughput; Privacy 1.2; LE secure connections; LE Ping; Long ATT MTU; Timeslot API enabling use with Bluetooth mesh or other proprietary protocols; and PA/LNA control function. In line with Nordic’s strategy of ensuring development tools are available on the same day as volume SoC launch, engineers can immediately start developing designs with the nRF52810 SoC and S112 SoftDevice using the latest version of Nordic’s nRF5 SDK. The nRF5 SDK v14.1 is a production-ready development tool with full peripheral driver support for the nRF52810 SoC. In addition, the nRF5 SDK now incorporates the capabilities of the earlier nRF5 SDK for IoT including an IPv6 over Bluetooth LE adaptation layer (6LoWPAN) and a complete Internet Protocol (IP) Suite. This capability brings native IPv6 support to nRF52810 SoC Bluetooth LE applications, enabling them to talk directly to connected ‘things’ over IP-based networks. The nRF5 SDK also includes SEGGER Microcontroller’s ‘Embedded Studio’, a complete all-in-one solution for managing, building, testing, and deploying embedded applications. The nRF52810 is a baseline Bluetooth 5 SoC, which gains its price/performance advantage from a smaller memory allocation and slightly reduced peripheral set. The peripheral set includes ADC and analog comparator; PDM digital mic input (x1); 4-channel PWM (x1); SPI (x1); I2C (x1); UART (x1); and Quadrature Decoder (x1). The SoC integrates an ARM M4 MCU providing similar computational performance and DSP functionality to the embedded processors used in the other nRF52 Series SoCs. It features the same 100 dBm link budget 2.4 GHz multiprotocol radio (Bluetooth 5/ANT/2.4 GHz proprietary) as the nRF52832 SoC, providing similar RF performance but with reduced radio energy consumption of 4.6 mA respectively for Tx at 0 dBm, and Rx at 1 Mbps. Radio output can be boosted to a maximum of +4 dBm. The SoC is available in two package variants: 6 x 6 mm QFN32 and 5 x 5 mm QFN16. A 2.5 x 2.5 mm WLCSP version will be available later. Click here to learn more about this Bluetooth 5.0 SoC.